This book deals with master data. It explains how we can recognize our master data. It stresses the importance of a good data model for data integrity. It shows how we can find areas of bad or suspicious data. It shows how we can proactively enforce better data quality and make an authoritative master data source through a specialized Master Data Management application. It also shows how we can tackle the problems with duplicate master data and the problems with identity mapping from different databases in order to create a unique representation of the master data. 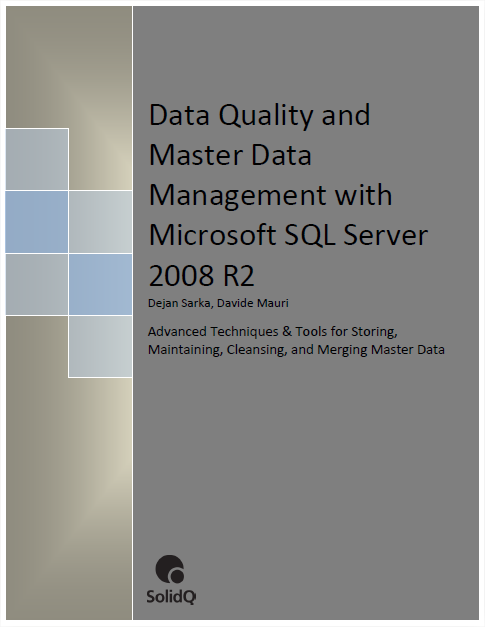 For all the tasks mentioned in this book, we use the tools that are available in the Microsoft SQL Server 2008 R2 suite. In order to achieve our goal—good quality of our data—nearly any part of the suite turns to be useful. This is not a beginner’s book. We, the authors, suppose that you, the readers, have quite good knowledge of SQL Server Database Engine, .NET, and other tools from the SQL Server suite. Achieving good quality of your master data is not an easy task. We hope this book will help you with this task and serve you as a guide for practical work and as a reference manual whenever you have problems with master data. · This book deals with master data. It explains how we can recognize our master data. It stresses the importance of a good data model for data integrity. It shows how we can find areas of bad or suspicious data. It shows how we can proactively enforce better data quality and make an authoritative master data source through a specialized Master Data Management application. It also shows how we can tackle the problems with duplicate master data and the problems with identity mapping from different databases in order to create a unique representation of the master data. · Achieving good quality of your master data is not an easy task. We hope this book will help you with this task and serve you as a guide for practical work and as a reference manual whenever you have problems with master data. · With three other colleagues from SolidQ, Itzik Ben-Gan, Herbert Albert, and Gianluca Hotz, we are forming a gang of four inside the company, called Quartet. It is not just unofficial group; our official duty in the company is to certify and confirm places for company parties. Our endless discussions during conferences, hikes, or time spent in pubs are an invaluable source of insight and enlightenment. Besides general help through our socializing, all three of them have made a concrete contribution to this book. Previous Post For Money and SQL Money Data Type Be Care full while using !!! !